Here we have a Polish grind band on their fifth full length, which is so-titled, according to their label Relapse, as “a word to the wise for close-minded metal fans”. Much as this “close-minded metal fan” has become a neat strawman in recent times, held up as a pinata for all that consider themselves as musical adventurers to blindly swipe at, it’s unlikely that many should have too hard a time devouring this excellent slab of quirky grind, as forward thinking as it undoubtedly is. Clear reference points are not difficult to locate. The death metal-influenced riffs are pummelling and agile, suggesting more recent Napalm Death efforts; a likeness to which the Greenway-esque bellows add further. But the promo case also lists influences that hint at something less straightforward, such as Discordance Axis, and even The Locust. Whilst you may be glad to read that playground moog interjections and bug masks are few and far between here, a more avant-garde sensibility is certainly the order of the day. Time signatures are tossed to and fro on Warning as if they were a paralysed mouse between the inquisitive paws of a cat. The real achievement is to accomplish this without compromising the album’s scintillating energy. 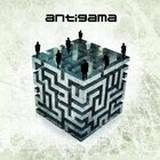 In fact, Antigama seem to understand that developing unpredictable rhythmic structures can in itself be a source of that energy, when used adeptly. You Have the Right to Remain Violent is a masterclass, with brutally staccato machine gun-like chugs interrupting urgent glissandos with irregular precision. Despite the fact that like much grind this moves by in a blur of mainly sub-two minute tracks, it is entirely possible to extract individual songs and understand them as such in their own right. Lost Skull is a case in point. The vocals assume a slight hint of almost Anselmo-like tunefulness (“melody” is not the right word) and the swinging riff almost in turn becomes a Pantera style groove. But its repetitions are moulded to deliberately jar rather than hook, and soon become the platform for a series of clattering and chaotic drum fills. The instrumental experimentation is furthered when this is replaced by squalling sounds that could almost be John Zorn on the saxophone. This debt to the wackier end of jazz, as well as the album’s sense of humour, is made explicit during the dissonant noodling of the instrumental Paganini Meets Barbapapex. This is creative and compelling grind music that reminds sceptics such as myself of how exciting the genre can be. It is experimental but immediate, brutal but fun. Recommended.